Discover High Density Rivet Shelving for your business, home or office! 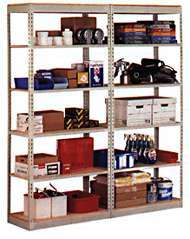 When you purchase Rivet Shelving for your organizational and storage needs, you’ll get all of the advantages that come with. The open design of Rivet Shelving allows access from all sides, even from the back thanks to side and back cross braces are not necessary for stability. An open design is just one of the many great benefits. When you choose to utilize Rivet Shelving from Shelving Inc., you’ll be getting so many perks. Rivet Shelving provides maximum vertical clearance for more storage. Use that vertical space wisely, convert wasted space into a useful storage area with Rivet Shelving. You’ll not only get access to stored items from all sides, but maximum space between shelves for storing larger items and easy retrieval. With Sturdy Rivet Shelving you get simplified and easy Storage of Retail, Wholesale or Industrial goods. Rivet Shelving is also the perfect solution to high density archive storage. But best of all, it’s fast and easy assemble, requiring no special tools. Try Rivet Shelving for your home, office or warehouse today! I like this site very much, Its a really nice office to read and get information. Sweet Post! I’ve already stumbled it. Good work! Thanks for such interesting article as I were in a position to discover here. I agree with much of what’s written the following and I’ll be coming back to this website again. Its like you read my mind! You appear to know a lot about this, like you wrote the book in it or something. I think that you can do with a few pics to drive the message home a little bit, but other than that, this is wonderful blog. A fantastic read. I will definitely be back. Wonderful blog. Thanks a lot.